On Sunday afternoon, I recorded a “virtual” seminar for Michael Margolis‘s REINVENTION SUMMIT which starts tomorrow. This is the premier online conference for people who are redefining themselves and their careers by using storytelling techniques to reframe their own circumstances and the meaning of their lives. At the recent MIPTV market in Cannes, I interviewed Philip DeBevoise, the co-founder of the super-hot online video startup Machinima. This Los Angeles-based company has experienced some incredible results in the past year. They reach a global audience of 166 million viewers and they serve more than 1.4 billion video views each month. That’s way bigger than any traditional TV channel. I’ve known Phillip’s brother (and co-founder) Allen for more than a decade. We worked together in the mid-1990s on pioneering online narratives and some early interactive TV concepts. I’ve watched his progress at Machinima with great interest because it offers some useful insight into the dynamics of the new video business that will eventually encompass today’s television industry. Here’s the video of my recent speech at TEDxMarin. The theme of the event was “Communication Revolution”. The organizers invited me to speak about the future of television, social media and personal storytelling. 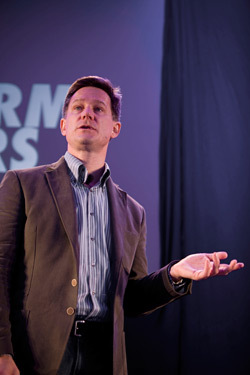 Robert Tercek at TEDxMarin May 2011: “Reclaiming The Power of Personal Narrative” from Robert Tercek on Vimeo. TED talks are all about passion and ideas. The ideas that get me most excited these days don’t come from big corporations or even startup ventures. They tend to come from individuals who are working outside of the context of business entirely. I decided to focus my comments on four activists who are using media to tell stories that literally change the world. I find these people very inspiring. They are some of the 85 Creative Activists sponsored by the Creative Visions Foundation, where I have been involved on a volunteer basis. Is it really necessary for Google to screw their customers? Yesterday, Jason McCabe Calacanis invited me to respond to his post “Has Google Been Naughty? Yes. Should the Government Get Involved? No”. You can read responses from Vivek Wadhwa and Robert Scoble along with mine in a handy digest on the Launch blog. The following post is the full text of my response to Calacanis view of Google’s future path. There’s a predictable cycle in business, at least in the sectors of technology, media and telecommunications. In the first part of the cycle, companies achieve success by introducing a new service that delights customers: call it the “Value Creation” phase. This is the phase when lots of customers sign up. Remember when you bought your first Windows computer, your first iPod, or your first smartphone? Chances are good that you made the switch at the exact same moment when millions of other people were migrating to these new gizmos, too. Everyone was attracted by a novel combination of utility, cool factor and the right price. Last week I attended the Digital Directions conference hosted by Fairfax Media and X | Media Lab in Sydney. A series of outstanding speakers, including Tim Wu, Gigi Wang, Kevin Anderson, Baratunde Thurston, Riyaad Minty, Anthony Rose and others shared their perspectives. This week I was a guest on “This Week In Careers.” Host Lisa Mandell interviewed me about career opportunities of the future. I spoke about several industries that will grow this decade and the steps to take now to prepare for the jobs of the future. Four industries that are poised for explosive growth this decade. This Week In is a bold new startup founded by serial entrepreneur Jason Calacanis and a smart young CEO Mark Jeffrey. Online video is growing fast, and this company is doing exciting things. They’ve mastered the art of rapid video production and low cost distribution, which are two evolutionary skillsets necessary to thrive in the online ecosystem. It’s definitely worth keeping an eye on ThisWeekIn.com. Why do innovation teams fail? At a time when margins are tight and disruption occurs on a daily basis, business leaders are under pressure to discover the “next big thing”, such as a breakthrough product that will redefine a category or create an entirely new niche to dominate. A new process that will save time and money. A radical efficiency that will restore fat margins. Are comic books the future of self help? New Google collaboration with Scott McCloud shows how. The introduction of Google’s new open source Chrome browser is newsworthy. So is the way that Google chose to explain the new features to users. Both items are sterling examples of collaborative creativity. Google teamed up with veteran cartoonist Scott McCloud to create a cool graphic narrative about the new browser.